Doctors have discovered brain abnormalities in the U.S. embassy victims of suspected attacks in Cuba. The doctors were searching for clues to explain the hearing, vision, balance, and memory issues suffered by the victims. The damage was discovered in the white matter tracts that let different parts of the brain communicate. The findings are expected to be published in an article being submitted to the Journal of the American Medical Association. According to reports, 24 U.S. government officials and spouses fell ill starting in homes and later in some hotels in the last year. The embassy workers reported loud, mysterious sounds followed by hearing loss and ear-ringing. A few Canadian Embassy staffers also got sick. The workers reported sounds audible in parts of rooms but inaudible a few feet away. Some were awakened by the sound while asleep and reported that others sleeping in the same bed or room heard nothing. Vibrations sometimes accompanied the sound. Physicians, FBI investigators and U.S. intelligence agencies have spent months trying to solve the Cuba mystery. Investigators initially suspected “sonic attacks” but are now working off of the theory that the sounds may have been the byproduct of something else that caused damage. Acoustic waves have never been shown to alter the brain’s white matter tracts. Some developed visual symptoms within 24 hours. Whatever harmed the Americans led to perceptible changes in their brains. After extensive testing and trial therapies, physicians are treating the symptoms like a new, never-seen-before illness. Most patients have fully recovered and are back at work, but roughly a third presented symptoms that persisted for long periods or continue remain to this day. The FBI investigation has struggled to identify a culprit, method, and motive. Secretary of State Rex Tillerson said Wednesday he’s “convinced these were targeted attacks.” U.S. officials wouldn’t say whether the changes were found in all 24 patients. It is unclear how the white matter changes might relate to their symptoms. 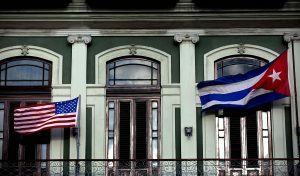 Cuba has adamantly denied involvement and says Washington hasn’t presented any evidence that U.S. workers were attacked. Cuba’s experts have concluded that the Americans’ allegations are scientifically impossible. The Cuban government has produced TV specials and an online summit regarding its own investigation into the matter.